Liposuction is surgery to improve the contour of your body by removing pockets of excess fat from specific areas of the body. "Lipo" comes from Greek word "Lipos" meaning fat. Liposuction uses suction to remove fat deposits. The suction device is inserted through a small incision in the body and the surgeon suctions out the fat tissue. Liposuction is not an alternate to weight loss. Fat can be removed from many different area of the body, including the thighs, abdomen, buttocks, breast , waist , upper arms and neck. Commonly call tummy tuck is a method of removing fat from abdomen. If your abdomen has excessive amount of skin and fat, a tummy tuck may be better option than liposuction. Abdominal area, Buttocks, Groin and Thighs can sag and may overhang like an apron. Body contouring removes excess sagging fat and skin and helps to improve the shape and tone of the underlying tissue. The final result is a more normal appearance to the body, with restoration of contours. This procedure can be done for adults of any age. What is tummy tuck procedure? 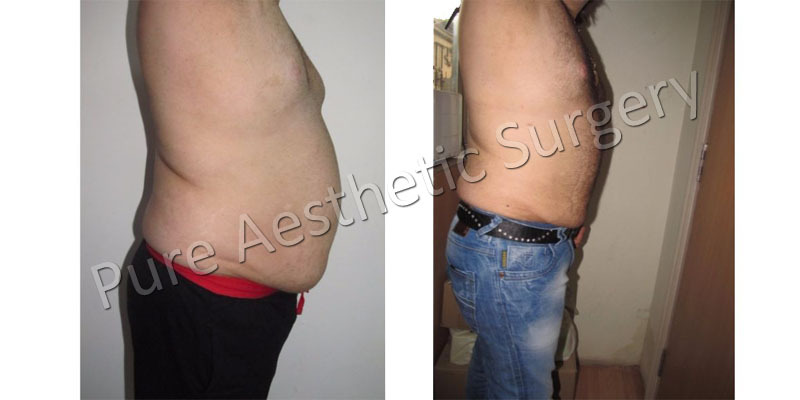 Tummy tucks means to remove not only the excess fat through liposuction but also to remove the extra skin envelope to give a proper desired shape depending on the body type. Also we make a neo-umbilicus using ones own tissues. It is usually a day care procedure with discharge on the same day or maximum the next day morning. As the skin envelope is also removed, we insert drains at the end of the procedure to remove the melting fat or extra fluid. This is usually removed in 2-3 days time or sometimes longer depending on the extent of incision. The incision is slightly longer than that of liposuction but we always try to keep the scar as low as possible so that it is hidden well below the belt. Any special tests required before tummy tuck? Apart from the routine tests we get for every surgery, ultrasound whole abdomen is required to rule out any hernia and to look for any recti divarication which needs to be corrected during tummy tuck to get the ideal result. What are the essential steps of the procedure? Tummy tuck involves the following steps: -1) Liposuctionof the excess fat. 2) Muscle repair or correction of any hernias 3) Neo-umbilicus formation. 4) Excess skin excision. 5) Final closure in layers, all stitches are inserted from inside to minimize scar formation. What is done post surgery? When can exercise be resumed? Immediately after surgery, after the dressings are finished, an abdominal binder or belt is applied to provide support to the newly shaped skin and abdomen.Drains remain in place for 2-3 days or even longer depending on extent of skin excision. Client is advised to take adequate rest at home following discharge and told to do active toe and hand movements. Bath is recommended only after 4-5 days or may be 6 days depending upon client to client. Normal walk and other activities can be resumed in a week’s to ten days time. Heavy exercises, gym, running, swimming is not allowed for the client till 8 -12 weeks post surgery. Abdominal binder is advised to be worn till 4-6 months post surgery. Who can perform tummy tuck? Is there any pain or bruising after surgery? Tummy tuck should only be performed by a board certified plastic surgeon. Pain is experienced post surgery for few days, which gradually wades away as day’s progress. Pain is easily controlled by analgesics. Slight bruising is always there on the areas treated, which disappears in a matter of 2-3 weeks. Tissue swelling is there after surgery, which initially increases and then subsequently starts decreasing with time. It usually takes about 8-12 weeks for swelling to completely subside and good contouring is evident. From almost bald scalp to head full of hairs, gives a hell lot of confidence, which reflects in personality. Thanks to Dr. SS Arora sir, for helping me build my personality through hair transplant. i was having intense hair fall and thinning problem. one of my friends suggested me to take treatment from dr sukhbir. I took PRP treatment from dr sukhbir and had a great response from the same. my hair fall and thinning improved very much and i became more confident while going out with friends. thank u dr sukhbir for the nice treatment. i am very happy and satisfied with my FUE results. thx to Dr Sukhbir singh..
Dr. Singh always takes time with me, he answers all my questions and never seems to be in a rush to move on to the next patient. I always feel completely satisfied after my appointment. There are no unanswered questions, doubts, or confusion. In short he is the best & completely understand his patient. Dr. Sukhbir has effective diagnosed and treated me for nearly every ailment I have ever had. He has reversed the clock and I have never looked or felt better. Everyone always thinks I am younger than I am, and people ask what is my secret all the time- it's Dr. Sukhbir! If you are serious about your health and looking great in a natural way, you will be very happy in Dr. Singh hands. Dr. Singh not only is tireless in finding ways to improve your health he really cares about his patients. Great energy and willing to go the extra mile for you! Dr. Sukhbir is a gift to healthcare. Not only for his vast knowledge, but his tireless commitment to his patients' well-being- mentally, physically and spiritually. The end result is an extraordinary level of care that is rarely seen.